Are you all up for some magical doors this morning? Who isn’t up for a magical door, right? 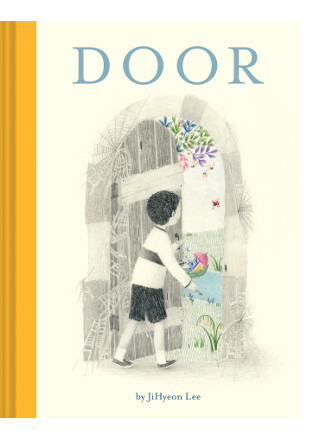 If you read and enjoyed JiHyeon Lee’s Pool (which I blogged about here in 2015), you may be happy to know she has a new book, also wordless, coming to shelves next month, called Door (Chronicle Books). It’s the story of a boy who finds a key, walks through a door, and encounters a fantastical world of creatures alien, but friendly, to him. Just as she did with Pool, Lee brings readers a palette that blooms in color as the story progresses. 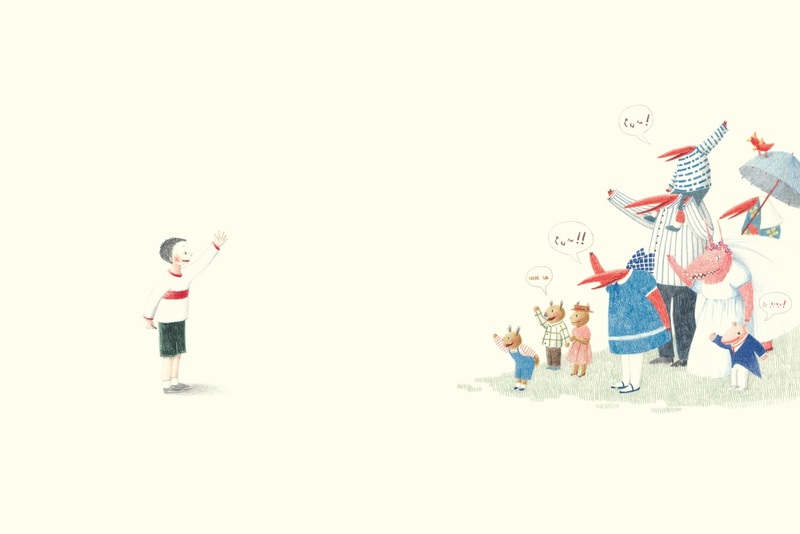 When the book opens, we see the boy walking in a world devoid of color; in fact, the people he passes appear without joy and even slightly suspicious. The boy follows a brightly colored, bizarre-looking flying insect, the very creature that had directed him to the key on the ground on the book’s opening endpages. 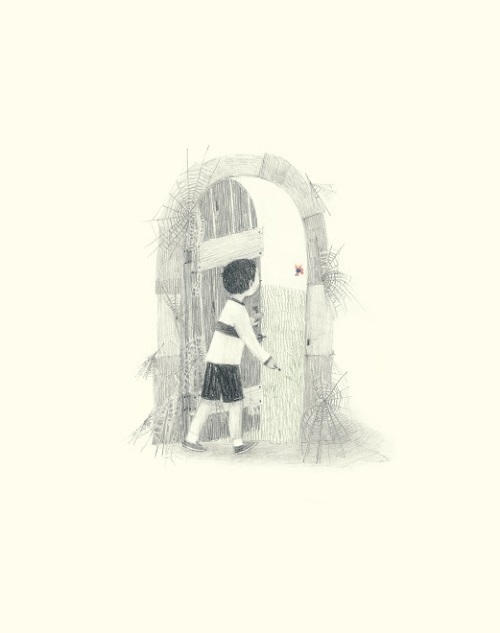 The insect flies to the door the boy will enter. It is cobwebbed. Clearly, it hasn’t been opened in a long time. As he walks through this world — filled with color, unlike his own world was — more color progressively comes to the boy and his clothing as well. And a smile comes to his face. This is a world of finely drawn anthropomorphized creatures, many of them red, furry, and with long snouts. Their language, depicted via speech balloons, is composed of squiggly lines. (Wannabe linguists will have fun with this one.) 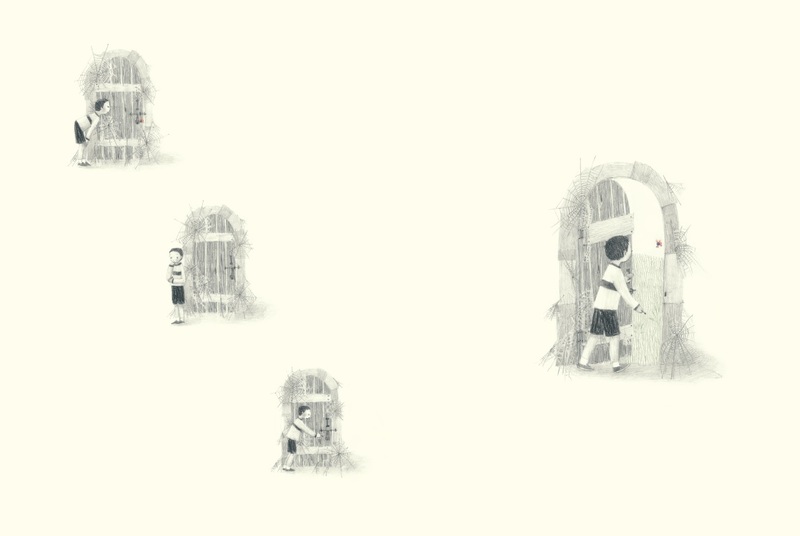 At one point, the boy follows his new friends to a field filled with multiple doors, which lead to all kinds of new landscapes. Out of one door comes a wedding party. The boy joins them to watch the ceremony. A feast follows. (How I love picture book feasts.) When one creature returns the boy’s key to him, he knows it’s soon time to leave — but not before joining a big, happy group photo. 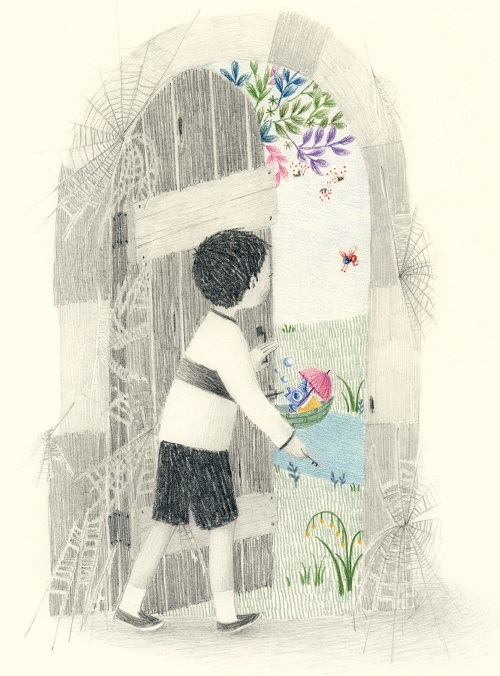 Lee’s delicate drawings of this richly imagined world are beguiling. You can see some below. Just as she did in Pool, she reminds readers of the delights of the creative imagination and its endless possibilities — only if you keep an open mind, that is, and are willing to walk through such doors. DOOR. Copyright © 2017, 2018 by JiHyeon Lee. 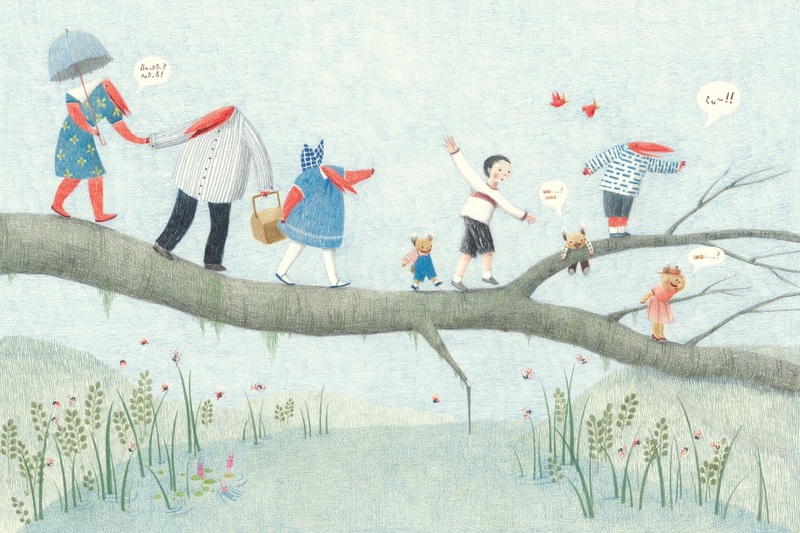 Originally published in South Korea in 2017 by Iyagikot Publishing Co. Illustrations reproduced by permission of the publisher, Chronicle Books, San Francisco. 1) I enjoyed helping to spread the word this past week about the Kidlitwomen* iniative. 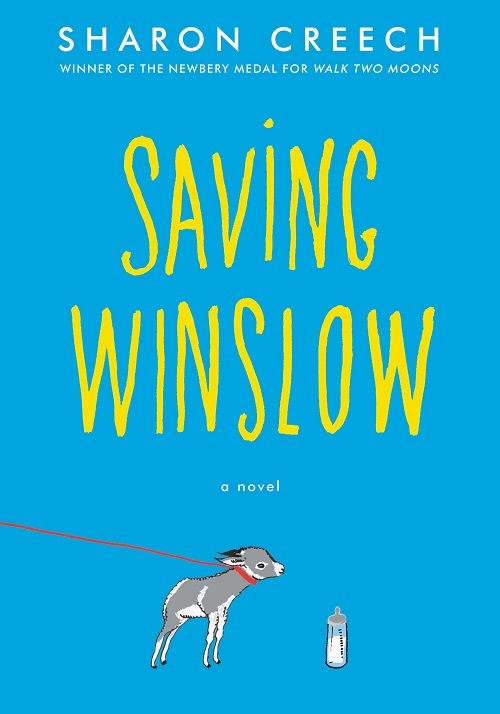 2) Reading Sharon Creech’s Winslow aloud to my girls. 3) Contributions from really talented writers. 5) An animated adaptation of Hilda premieres this Friday. I’ve been waiting a while for this one. 6) Being a matchmaker of friends for like-minded souls. 7) Heading tomorrow (I’m typing this on Friday, which means on Sunday, I’ll really be talking about yesterday) to the wedding of someone I used to BABYSIT. Aw. Also, it will not only be in beautiful East Tennessee, but it will also be on the gorgeous campus of my alma mater. Trips to East Tennessee are always worth it. I love Lee’s new book. Love what mysteries hide behind doors. Jules, hope your weekend was joyous and fun. Love the long lists of book nominations. 1. Reading The Turning by Emily Whitman. Selkies! 2. Supporting teachers on the last picket line. They finally are voting on a contract. Last district in SW WA. 3. Officially signed up for the October Poetry Workshop at Highlights in PA.
7. Purchased tickets to see Andy Borowitz in January. Jules: Hilda looks like fun! I hadn’t heard of the comics before. Yay for matching friends. Have a fun trip! Jone: Yay for good people fighting the good fight, good friends, and good times. Stopping by to say hello! JiHyeon’s work is beautiful, and this new one looks so fun! Thank you for sharing about it. Jules, sounds like a nice week – especially reading with your girls! Jone, time with friends and imminent fall are wonderful. Little Willow, reading, sharing, and music sure sound like ways to find joy. 5. guitar fingertips (they are little silicon protective tips so you can play without discomfort – for those of us who play only intermittently and do not develop the calluses). Dow: All of your kicks are great. Kick #5 sounds awesome! I haven’t pursued learning guitar due to said discomfort. Jules, those kinds of we’re-so-old moments seem to be stacking up for me these days. Must be a sign that we’re firmly in middle age. Hope the wedding was fun. Nice to see some old familiar names here for kicks. I pondered Little Willow’s Seven Impossible Doors challenge, but got stuck on the idea of arriving at Hogwarts as a muggle. 1. Finished the new Penderwicks tonight, which we mostly read aloud as an entire family — even the high schoolers kept lingering in the living room whenever they heard me start a chapter. Still felt like slipping into a warm bath with good wine, but we all struggled with the last half. I think the rest of the series (and our irrational devotion to it) raised the bar so high that a satisfying conclusion might have been impossible. 2. Emerging from a nasty hockey collision with a pinched nerve and plenty of it-could-have-been-much-worse gratitude. 3. Good starts to the school year for all three kids. 6. Jon Hopkins and Rival Consoles for perfect soundtrack music when I need to get work done. 7. Autumn rains after a summer of smoke and fire. Jone, best of luck to the teachers. So good that you are still there to support them. Keep us updated. Tink, I’m with you. I think I’d have to pick Wonderland too. Also, bread is an eternal kick, isn’t it? Blaine and the girls make two loaves of fresh bread every Sunday for us to chow down on all week. Hi, Dow! Did you just start learning to play guitar? Happy playing. JEREMY! Long time, no see. So good to hear from you and to hear all is well. I really need to re-read that last Penderwicks, because I read a galley and then heard a few changes were made to the final. …. I’ll have to look up your sixth kick, as I’d like some new music recommendations anyway (so, thanks!). Glad your hockey injury isn’t debilitating. I had a shoulder injury this week (carrying too many picture books, OF COURSE), and I’m grateful for steroids. And that, as you said about your collision, it could have been worse — and wasn’t. Hi Jules! I played as a kid, and then I just started up a little bit for book presentations/storytime. I know 5 chords well, and those get me through a simple song or two for children! Now if only I could sing.. Have a great week, too! Jeremy: Sending you healing thoughts! Jules: Homemade bread on a weekly basis? Your family is kind of awesome. 🙂 Yay for Wonderland and yay for Tinker Bell.